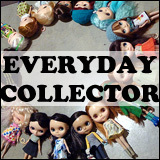 BlytheLife.com » Interview with China-Lilly! The 2012 March Talent Showcase’s first feature is Samantha! 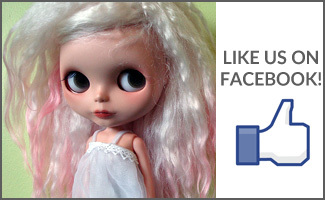 She’s also known as China-Lilly in the Blythe community and she customizes Blythe. She’s been customizing for just over a year now and I love her work. It’s always so much fun to see how the a doll can be transformed into a work of art. 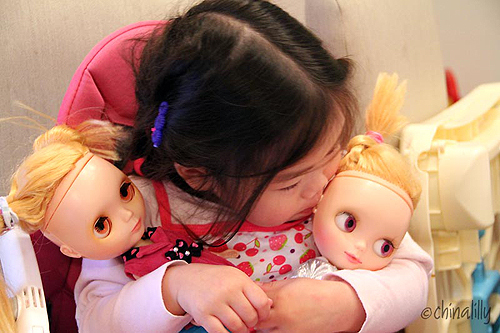 Her talents as a make-up artist cross over into the beauty of her magic on dolls. Samantha and her daughter, Indy. Hi Sam! What can you tell us about yourself? I’m Samantha. I live in Sydney, Australia. I am currently a stay-at-home mum to Indiana, 2.5 and Harrison, 1; but before that I was a graphic designer and makeup artist. How did you discover Blythe and what attracted you to her? I discovered Blythe through Gina Garan’s photography, which was printed on various t-shirts and bags. I just loved Blythe’s quirky look. I am a huge fan of model/actress Devon Aoki and I see a similarity between her and Blythe. I collected quite a few of these t-shirts and bags but strangely enough never purchased a Blythe doll until the end of 2010. I do remember picking one up in a store and thinking I was too old for dolls! Custom #9, the lovely Nightingale. 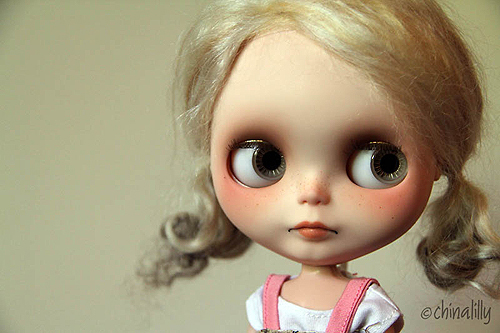 Why did you decide to start customizing Blythe dolls? I discovered custom Blythe’s very soon after I purchased my first girl and immediately knew I wanted one. I didn’t have the courage to do it myself at that stage, so I sent my Nicky Lad to Maria of Chuthings. About 3 months later, I finally worked up the nerve to do one myself. My first custom was Kitten in February. Then I made Pastel in March. But my third custom wasn’t until July. Somehow or other that number jumped to 30 by the end of 2011! Custom #13, Narcissa Rose (reroot by Blythe Laboratory). 30 customs is a lot in such a short period of time! Which one has been your most memorable custom so far? It’s hard for me to pick just one … one might be my favourite artistically, and others for different reasons. Pastel is one because she introduced me to Belinda/dolls4emily, who was the one to encourage me to take commissions; Narcissa Rose because her look is so striking, Vincent because she was my attempt to give back to the Blythe community, who has helped me through a tough time in life. What kind of lessons did your first custom, Kitten, teach you? The main thing would be just do it! Taking that first step is the hardest and the rest is easy. If you had told me 18 months ago that I would be a doll customiser, I probably would have laughed at you! Custom #32, Magnolia. Gotta love the handpainted chips! 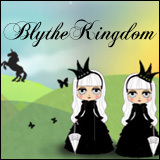 What have you learned about yourself throughout the course of the last year with customizing Blythe? 2011 was a tough year for me. 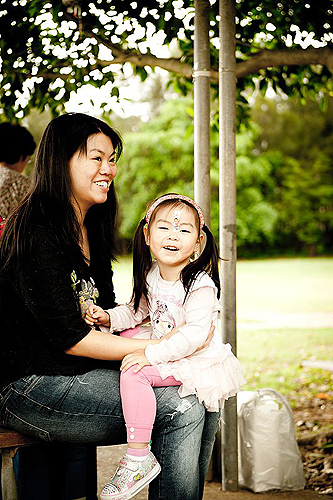 I was diagnosed with post-natal depression and found many days hard to get though. Blythe really encouraged me to be creative again and that helped me so much. I guess I needed that artistic outlet, having always been a creative person, but I no longer had that through work. I am quite a shy person and it’s hard for me to make new friends. I know so much of the community is online, but through Blythe I met Nancy/tinycutethings, who has children at around the same age and lives close by. And because I felt that the Blythe community gave me so much, I decided at Christmas time that I would sell Vincent for $5 so that she might help someone else through a hard time. Virginie/Tibiloo ended winning the opportunity to buy her and she gifted Vincent to Gaia. I could not have asked for a better outcome! Has being a graphic designer and make-up artist helped or hindered you in any way from being artistic with Blythe? I would not say it has hindered me, but it has been a big influence on the type of girls I make. The faceups that I do are very similar to ones I would do on models. I love colour, so I don’t generally make girls with subtle colouring. I also use some of my makeup brushes to do my faceups – I was a bit of a brush junkie, so I have lots and lots and lots of brushes! I didn’t like airbrushing foundation on models (it just seemed to me too much to carry and I had problems enough fitting everything in my kit), but I think I would like to try it for Blythe’s someday as customising is not really work I need to do on location! Which would you say is your favourite mold type to customize and why? RBL. I find them to be the most versatile. Even for my own collection, I am drawn to RBLs first but then, maybe that’s because I’ve done more RBLs than any other mold. I am learning to love FBL customs. I’ve only done one EBL so far, so looking forward to doing more of those. Your custom work is beautiful. At 30-plus dolls now, where do you draw inspiration for the dolls? It can be anywhere! A colour, a book, a movie, a fabric … I do watch a lot of Sci-fi, which is why I have dollies named Helo (Battlestar Galactica) and Ronon (Stargate Atlantis) LOL! A lot of the more recent dolls have been commissions and their Mummies often have a general idea of what they want for them. And that’s actually a good thing for me, because sometimes it pushes me in directions that I would not normally gravitate – like #31 Domino. 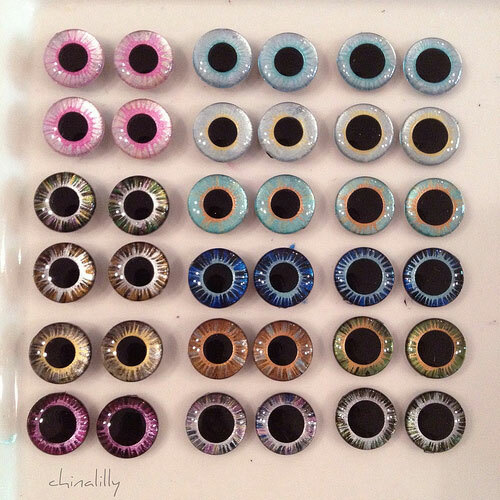 A small selection of handpainted eyechips by China-Lilly. What do you know now that you wish you had known when you first started to customize Blythes? I think a lot of it is trial and error. Without having gone through that learning curve, you can’t develop your own style. I do wish I knew how to carve better then – I did find a lack of step by step on how exactly it’s done, but over time, I’ve found my own techniques and preferences. I do really wish I could sew though! You said that you’re a stay-at-home mum. How do you balance your customizing/work time with family time? It is a fine balance to strike. Indy started “customising” a Basaak with me for a time and it was fun to share that with her. She has 2 clones of her own and has named them “Dish” and “Ugly”. But as Harry gets older and more active, I find I have to wait until they are asleep or in daycare. They now attend daycare 2 days a week, which is when I get most of my customising done. However, it’s likely that I will start part-time work on those 2 days sometime this year, so that will definitely impact on dolly time. Indy with her dolls, Ugly and Dish. Thank you so much for doing this interview with me, Samantha! What advice would you give to someone who’s just starting out in the Blythe world? I’ve found the Blythe community to be generally welcoming and helpful, so if there are any questions, just ask someone! Most people are really eager to share their knowledge. You can find Sam (a.k.a. China-Lilly) on Flickr and at her blog (Indy & the Ninja). 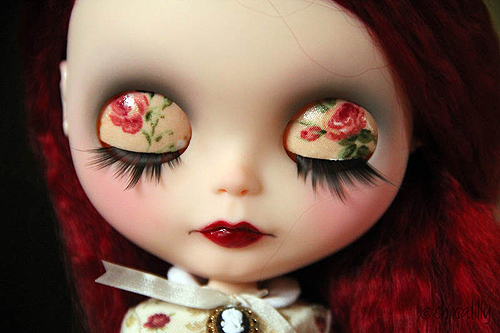 You can also find her handpainted eyechips for Blythe at her Etsy shop. Great interview! It’s so cool to learn about newer customizers, I think China-lilly’s work is beautiful and I hope she takes commissions! , Hey,how you doing? I thought it was a liltte stange but I didn’t want to be rude, so I said, not too bad, thanks. After a short pause, I heard the voice again, So what are you up to? Again I answered, somewhat reluctantly, Just had to take a dump .how about you? Small pause again, then the voice said, how about when I’m done here, I come over there? I got freaked out and said, listen buddy, I just needed to use the toilet and I don’t want any funny business! The next thing I heard was, sorry, I’m gonna have to call you back, the guy in the stall next to me thinks I’m talkin to him. Ohhhhh, she does awesome eyechips! I need some for my dolls. LOVE the interview! Love the interview. Sam, you definitely are a very creative person. I love the girls you have customized. I loved the interview. 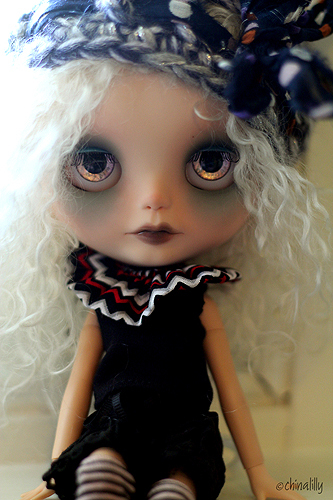 It’s always a treat to see Chinalily’s newest customized girl–they are always beautiful! Loved the Interview – Thanks Sam for mentioning me !!! Your work is amazing and anyone who has a China Lilly custom will just know how talented you are !! !